While the Subaru WRX gets plenty (and I do mean plenty) of love in the performance world, it’s not the only Six Star out there to offer a heady dose of thrills behind the wheel. Take the Legacy RS, a turbocharged AWD slingshot which, properly prepared, can still bring the heat in a major way, as evidenced by this 3-minute, 35-second hill climb video. The vid includes both exterior shots and interior shots of the Legacy’s run, and provides plenty of pops and bangs through the audio to get your blood flowing. 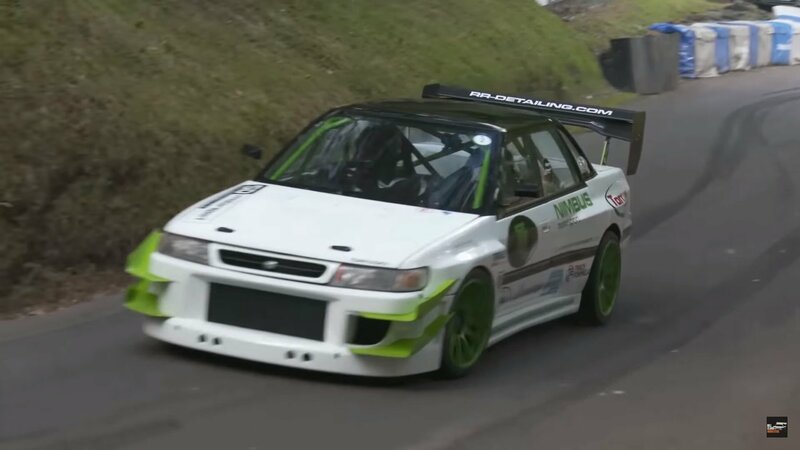 According to HillClimb Monsters, the channel that posted the video, the Legacy belongs to Damien Bradley from Team Legacy U.K., and comes fresh from the world of time attack competition. Specs include a six-speed sequential race transmission (man, that thing is loud in the interior shots), race-spec six-pot brakes from Alcon, and Nitron suspension bits. Apparently, its also got 700 horsepower thanks to a fully built boxer engine and GT35R turbo, although we think the tune might a bit lower, at least on this particular run. Either way, seeing this thing scorch its way up the hill is a delight all the same.